It’s back to school time! I’m glad I live in a country that values education. Learning and expanding knowledge add so much to the adventure of life. Today, I also went back to school…to teach students at the University of Valley Forge about the Bible and ministry. 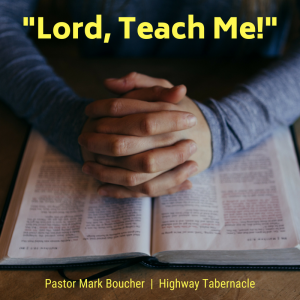 The saying is true, “If you want to really learn something, then try teaching it.” Through the years, the preparation for preaching and teaching has enhanced my life more than I can adequately describe! When I think about the foundation of learning, Psalm 25 comes to my mind. From God’s perspective, true education is not merely the accumulating of information, but the experience of transformation. Ponder what the Psalmist wrote: “Show me your ways, O Lord, teach me your paths” (v. 4). “Good and upright is the Lord; therefore he instructs sinners in his ways” (v. 8). “Who then, is the man that fears the Lord? He will instruct him in the way chosen for him” (v. 12). A while ago, I was looking for a rubber band and reached for one that had been sitting on a shelf for a long time. When I stretched it a little bit, all of a sudden it broke. It had been on the shelf too long. Rubber bands are not made to sit around; they are made to be stretched. God believes in “stretching” us—not to break us through stress, but to bring us into a greater place of faith in Him. When we stretch our minds through learning and education, we grow in God and experience a greater sense of usefulness. Adopt the attitude of a learner, and let the Lord teach you His ways…and enjoy the adventure of growing!